Delhi CM Arvind Kejriwal and Dy chief Minister Manish Sisodia participate in a mass yoga session along with other yoga practitioners to mark the International Day of Yoga 2015 in New Delhi. 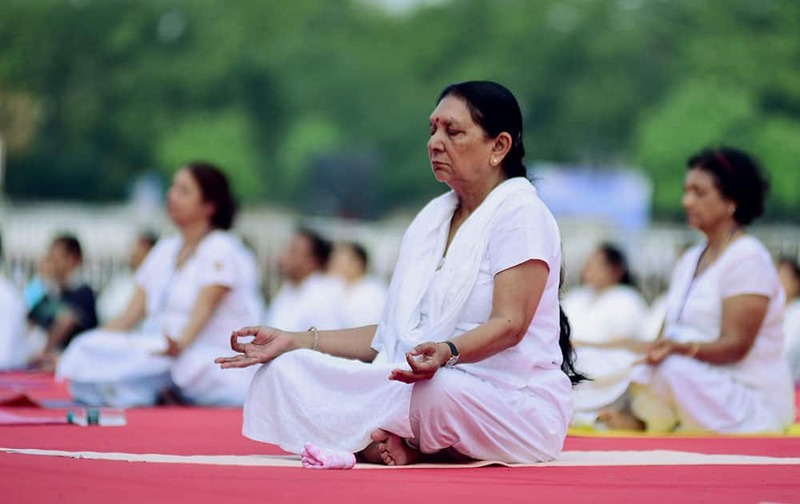 Gujarat Chief Minister Anandiben Patel performs Yoga during a mass yoga session on the International Day of Yoga 2015 at GMDC ground in Ahmedabad. 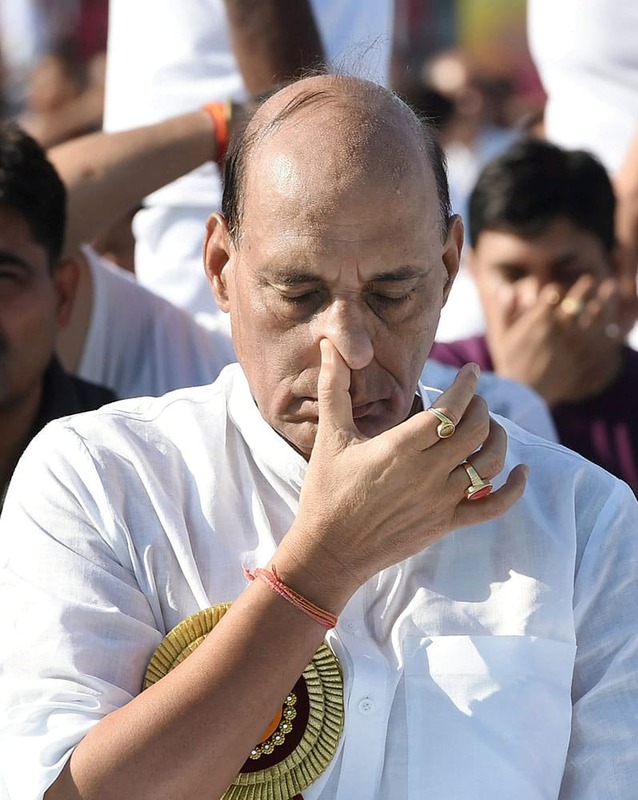 Union Home Minister Rajnath Singh performs Yoga at a mass yoga session to celebrate International Day of Yoga 2015 in Lucknow. PRIME MINISTER NARENDRA MODI, CENTER, SITS ON A MAT AS HE PERFORMS YOGA ALONG WITH THOUSANDS OF INDIANS ON RAJPATH, IN NEW DELHI, INDIA. Bollywood actress and national ambassador of yoga Shilpa Shetty smiles while performing yoga at an event to celebrate International Yoga Day in Bangalore, India. 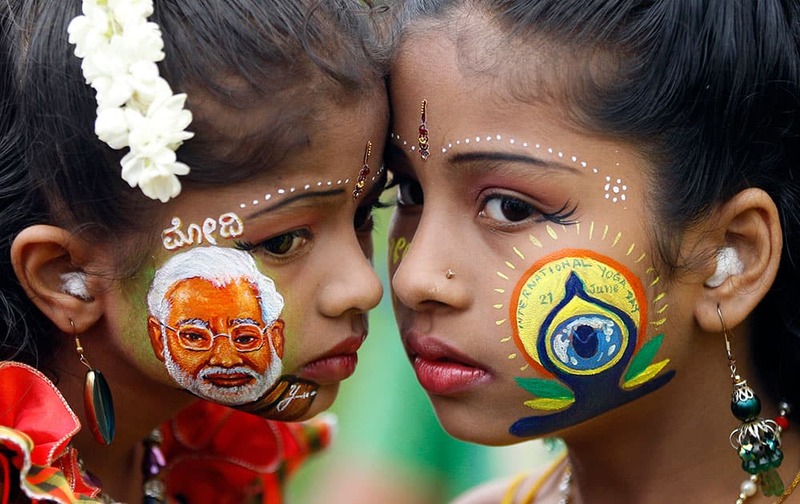 An Indian girl, left, displays a picture of Indian Prime Minister Narendra Modi painted on her face as another sports the logo of International Yoga Day in Bangalore, India. 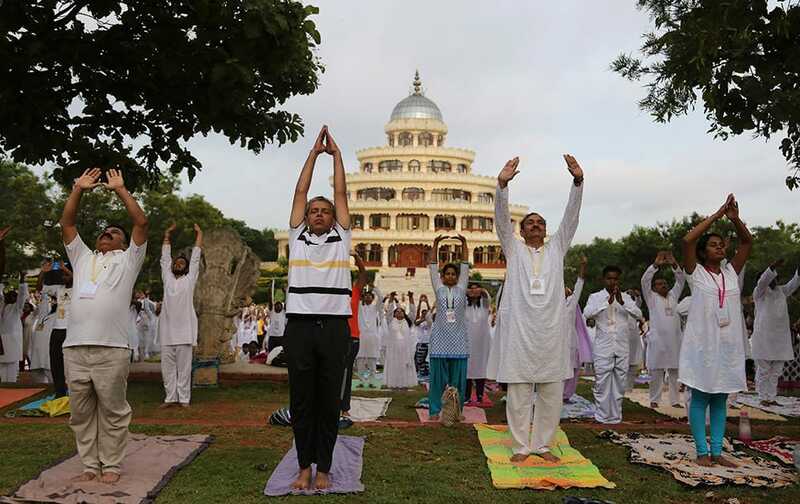 Indians perform yoga at an event to celebrate the International Yoga Day in Bangalore, India. 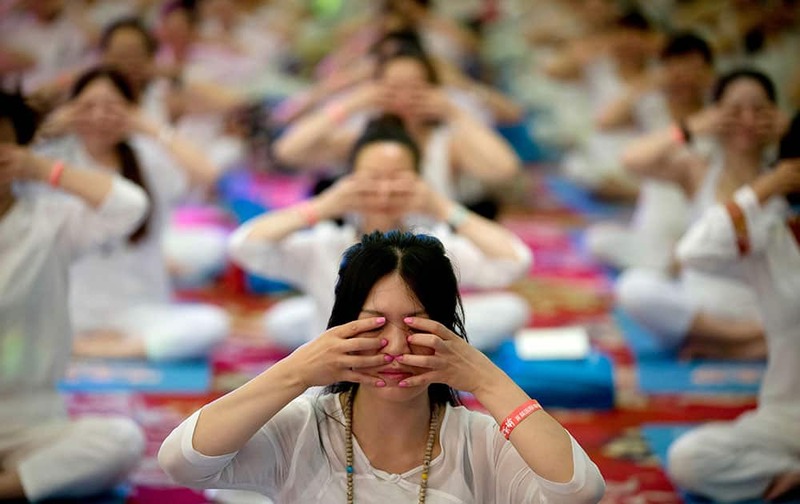 Chinese perform yoga under the instructions of Indian yoga teachers at a hotel banquet hall to mark the International Yoga Day, in Changping District, on the outskirts of Beijing, China. Participants of the International Yoga Day during the full dress rehearsal for the event in New Delhi. School children participate in a full dress rehearsal for International Yoga Day at Rajpath in New Delhi. 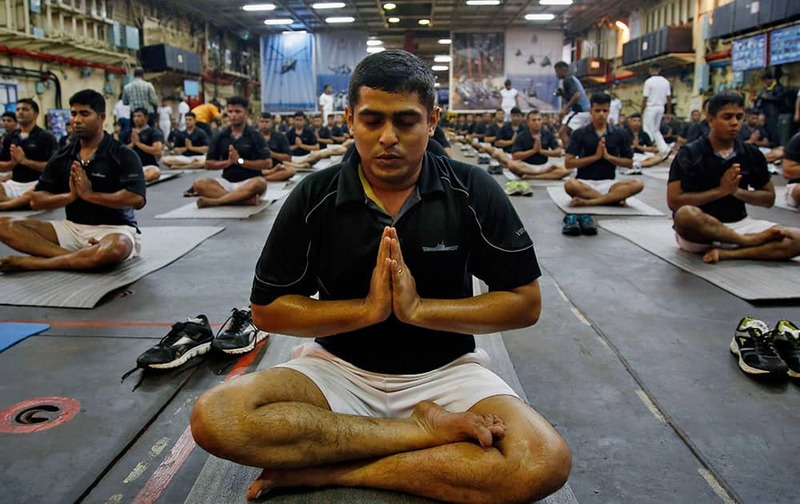 Indian Navy men perform Yoga during rehearsals for the International Yga Day to be marked on June 21, in Mumbai. 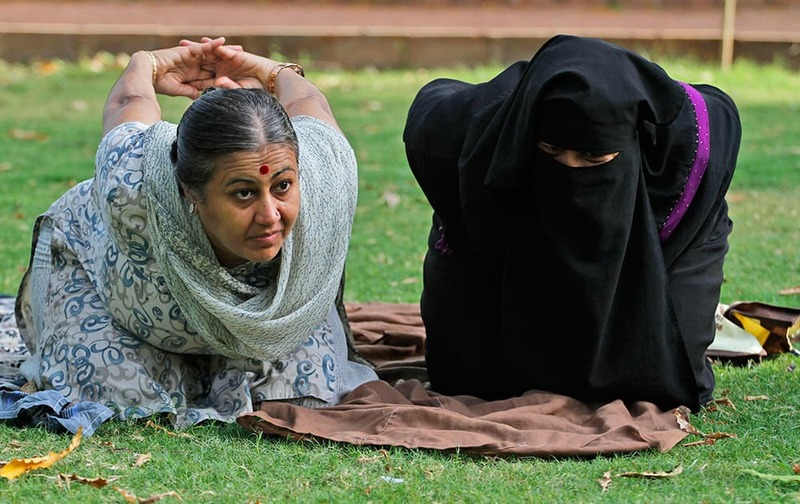 Yoga trainer Chandrikaben Kansara teaches yoga to a Muslim woman in a garden in Ahmadabad. Yoga has a long history India, reaching back for thousands of years. 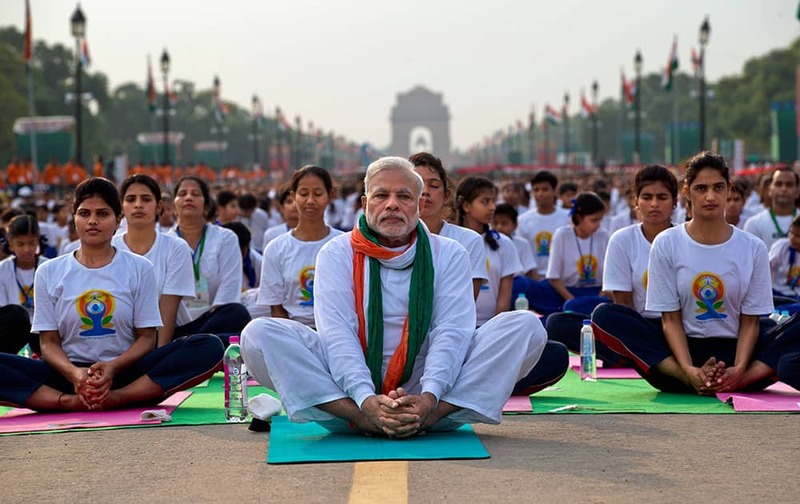 The government of Prime Minister Narendra Modi has made clear it wants the first International Yoga Day, held on Sunday, June 21, 2015, to be taken seriously. Children participate in a yoga convention program in Hyderabad. 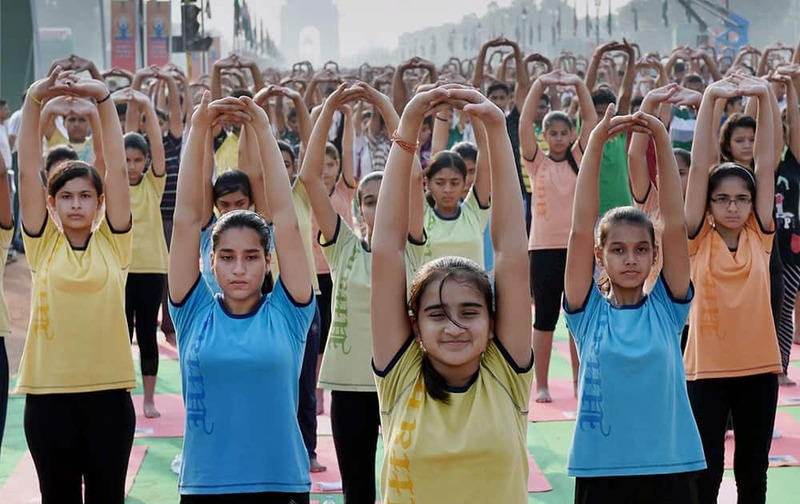 Sunday, June 21, marks the first International Yoga Day, which the government of India’s Prime Minister Narendra Modi is marking with a massive outdoor New Delhi gathering. 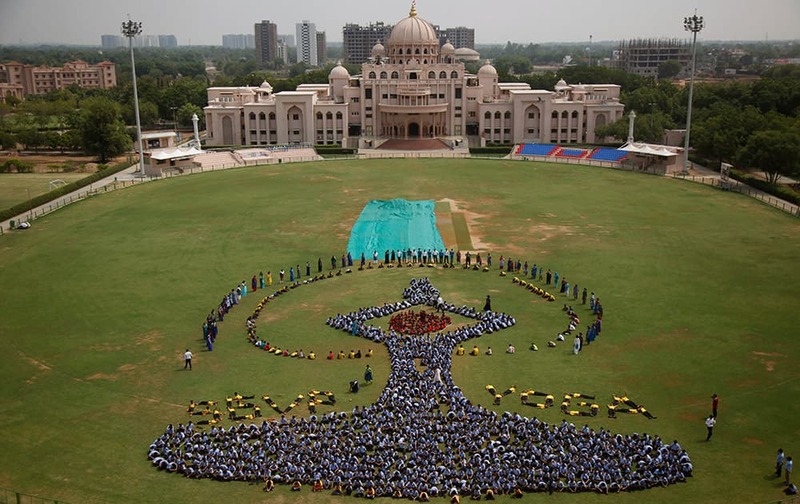 Students make a formation of the International Yoga Day symbol at a school in Ahmadabad. 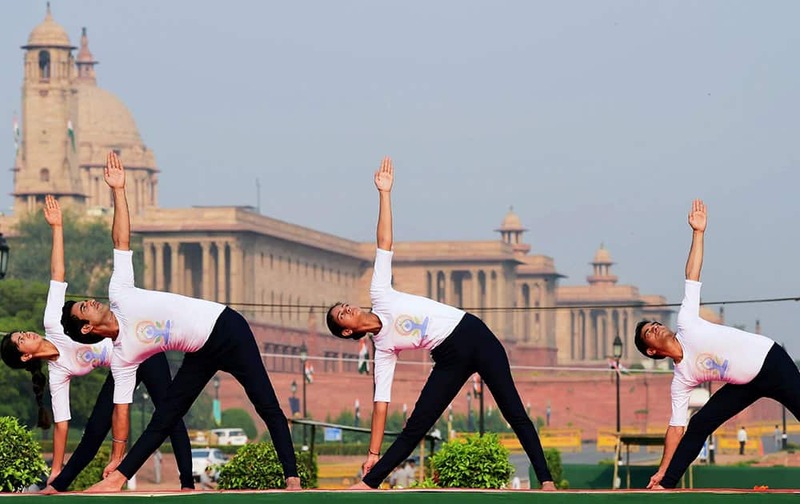 Sunday, June 21, marks the first International Yoga Day, which the government of Prime Minister Narendra Modi is marking with a massive outdoor New Delhi gathering. 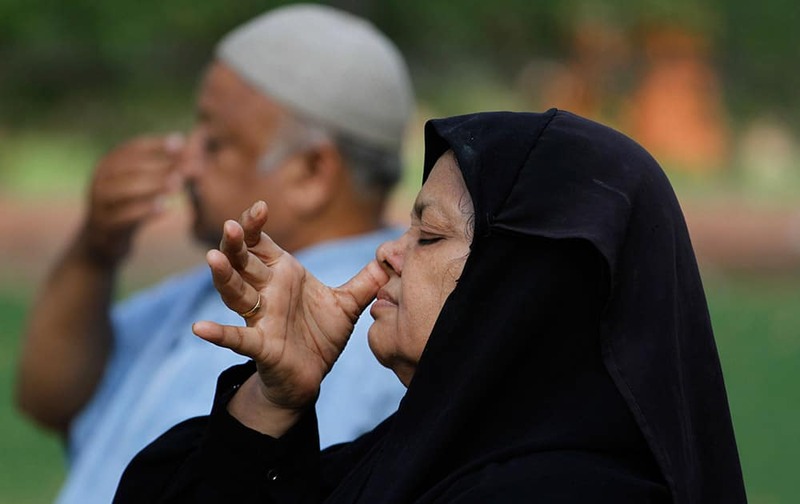 A Muslim woman and a man perform yoga at a garden in Ahmadabad. People perform yoga at the Morarji Desai National Institute of Yoga, in New Delhi. 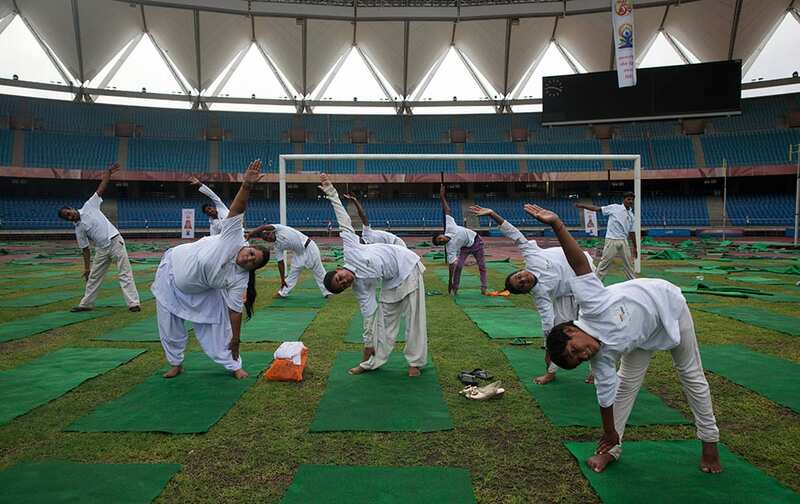 People perform yoga in a stadium in New Delhi. A man performs yoga in a stadium in New Delhi. 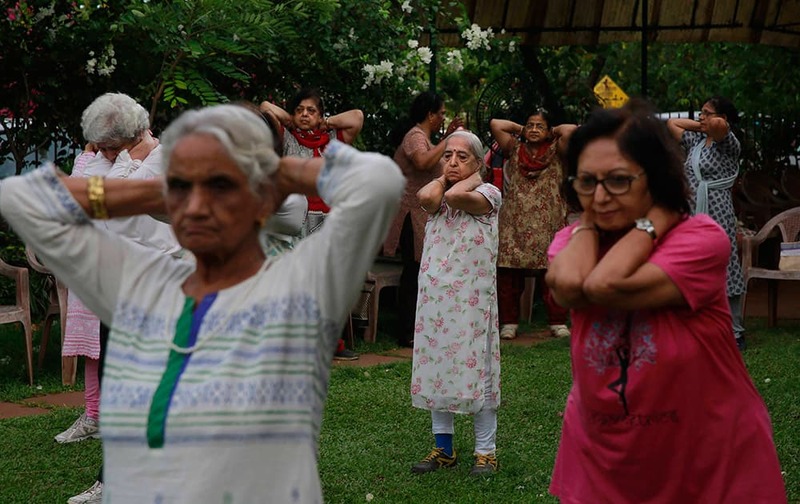 Elderly people perform early morning yoga in a park in Mumbai. 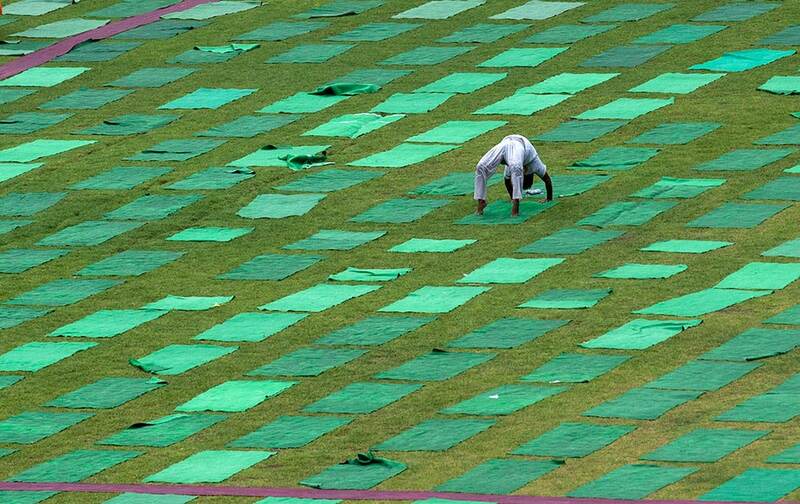 Indian paramilitary soldiers performs yoga exercises inside a base camp in outskirts of Srinagar, Kashmir. 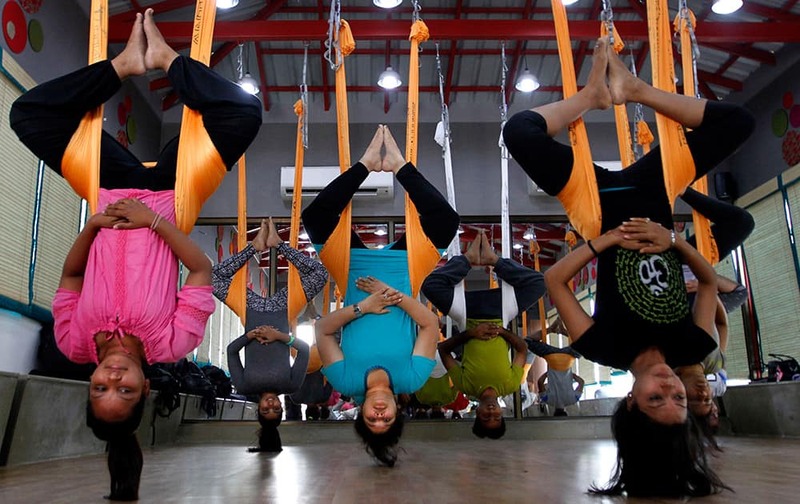 People perform anti gravity aerial yoga in Ahmadabad. 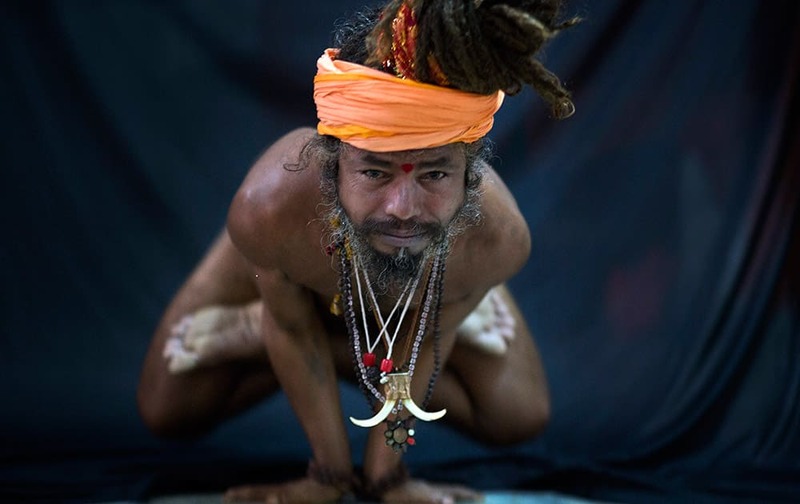 Hindu holy man, illustrates the yoga pose Kakasana, or the crow pose in Guwahati. Hindu holy man, illustrates the yoga pose Ardha Sirasana, where the yogi lies on his back and puts his crossed legs in the air, in Guwahati. 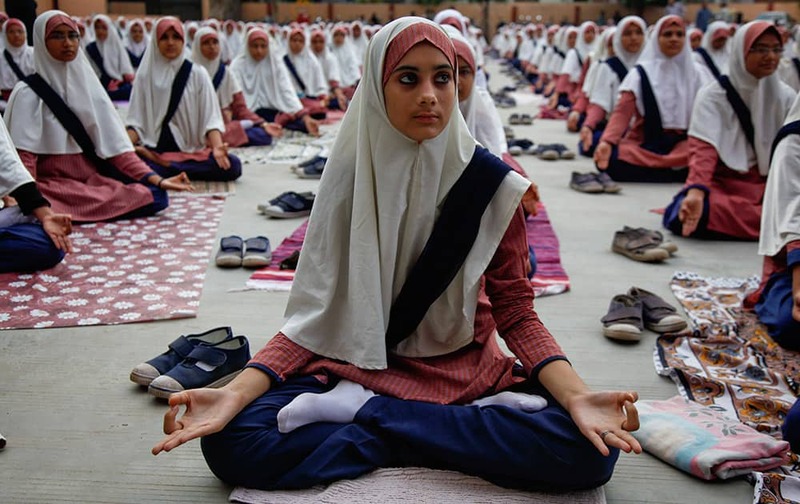 Muslim students practice yoga at a school ahead of first International Yoga Day in Ahmadabad. Yoga guru Baba Ramdev and former All India Imams Organisation general secretary and now a former member of the India Against Corruption core committee Mufti Shamoon Qasmi perform Anulom Vilom or Alternate Nostril Breathing exercises during a practice session ahead of International Day of Yoga in New Delhi. 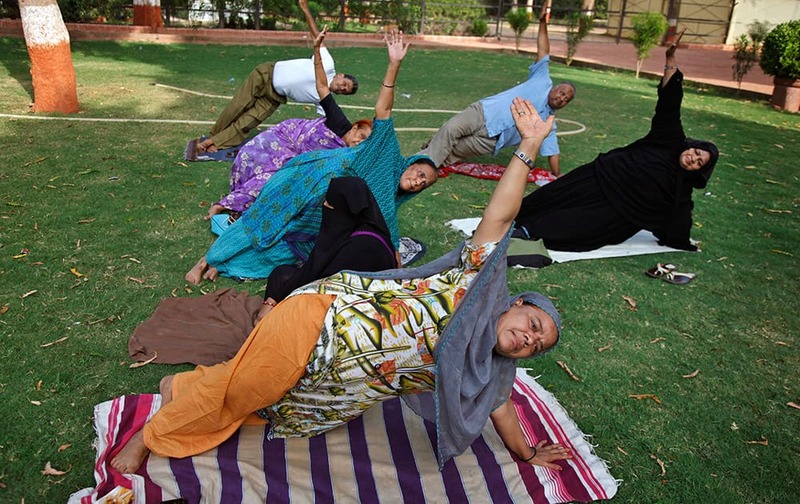 People perform Yoga exercises at a garden in Ahmadabad. A Muslim woman performs Yoga exercises at a garden in Ahmadabad. 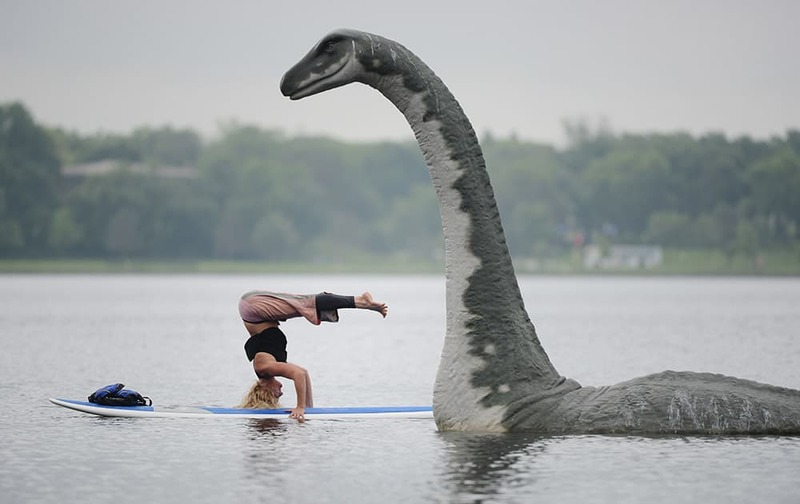 Stachia Fey, of the Wai Nani Surf and Paddle Tribe, strikes a yoga pose on her paddle board next to Minne, a 13' fiberglass lake creature on Lake Calhoun in Minneapolis, Minn.
Yoga enthusiasts perform Surya Namaskar or sun salutation as they participate in a prelude to the International Yoga Day at the Art of Living headquarters on the outskirts of Bangalore.